While most people have heard that the written word dates back to around 3,000 BC and Mesopotamia, there is a growing body of evidence to suggest it extends back even farther, to roughly 6000 BC in China. Whichever date you choose, writing has been with humanity for a long time, and until the last 50 years or so, has always had a physical presence: the written word was written on some tangible object. 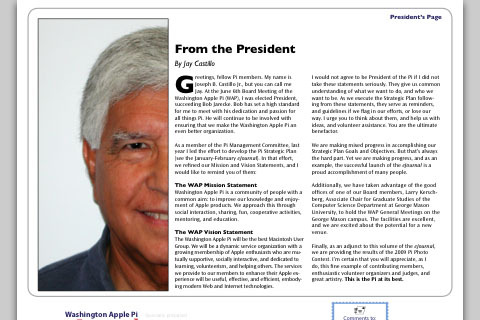 Washington Apple Pi electronic journal on an iPod touch (full size). Washington Apple Pi electronic journal on a Mac screen (click for full size). This changed with the advent of computers. IBM’s invention of the hard drive in 1956 allowed written information to be stored magnetically. Letters, words, punctuation and such were not stored a scratches on stone or dye on papyrus, but as magnetic domains on the surface of a metal plate. Flash memory, developed by Toshiba in 1980, took this level of abstraction even farther, storing information in transistor gates. As a result, you can now carry around, in digital form on an inexpensive flash keychain drive, every single word of every work we know about from Rome’s empire, in both the original Latin and in an English translation. Electronic media has much to recommend it. A single iPod, for example, can hold all the music recordings of every pre-20th century composer. For most of human history, music was limited to live performances, usually by close friends, relatives, and members of your village. Only royalty and the well-to-do could hear a concert, but now you can own every symphony ever written, in your pocket, available at the touch of a button. This same compactness and portability applies to the written word. Amazon’s Kindle, introduced in 2007, could hold the equivalent of 200 books. The Kindle 2, introduced in 2009, upped this to 1,500 books, and the Kindle DX, also introduced in 2009, raised this to 3,500 books. These “books,” however, are just text; illustrations, if any, are in black and white or shades of gray, and illustrations reduce the overall capacity of the Kindle. Quibbles aside, the idea of carrying around a fairly large library in something about the size of a trade paperback book is attractive. Amazon makes it easy to buy new books, allowing you to purchase new titles directly from the Kindle and pay by credit card, and the book is delivered wirelessly to the Kindle. They tout this as being fast, easy, efficient, and inexpensive. As a book lover (with thousands of books), I am intrigued by the possibilities, but unsure of the economics. The average Kindle title is $9.99, which is an alleged savings of as much as 75% over the cost of a hardcover. Yet in an informal survey of the last 78 books I’ve purchased, only three were available on the Kindle, all for $9.99. Significantly, two of the three were also available in paperback – for less. “Kindle editions” tend to favor text-based best sellers and books in the public domain (i.e., books long out of copyright that cost nothing); if you want technical documentation (computer books, for example), or scholarly books, or books on obscure topics in history, or anything that requires extensive photos and graphics, the Kindle is a poor choice. Amazon also touts the ability of the Kindle to download your newspaper and have it readily available in a nice, compact form, and at a lower subscription price than the paper version. This is attractive – much of our home recycling consists of old copies of the Washington Post – but the Kindle editions come without any tables, most photos and graphics are missing, the comics (the comics??) are not included, etc. 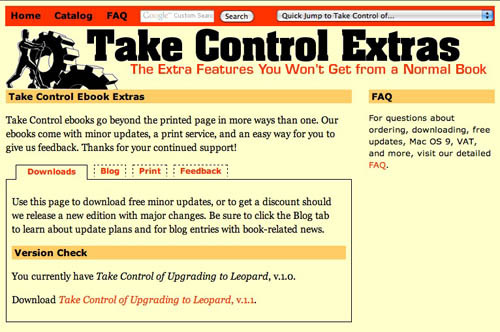 Take Control electronic book on an iPod touch (full size). A recent, lengthy, highly enlightening discussion on the Pi’s forums, the TCS, revealed one great strength of the Kindle: you can load it up with PDF documents. Have a bunch of work documents you need to read, but don’t feel like carrying around a briefcase full of loose papers and notebooks? 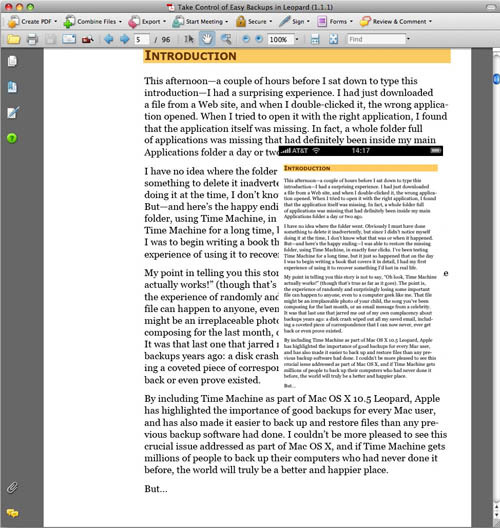 Convert the documents to PDF, and upload them to the Kindle. Most of “work paperwork” is disposable, anyway; why kill a tree? Using a Kindle for ephemeral documents sounds like an ideal fit, even if it isn’t what Amazon has in mind. How about them iPhones and iPod touches? When the iPod touch and iPhone were introduced, with those glorious, large (for an iPod) screens, one of the first things people tried to do was turn them into tiny Kindles. Apple’s iTunes App Store has thousands of entries in the Books category, including hundreds of free books, book readers, and other texts. Amazon created a (free) Kindle for iPhone application, and it has been on the App Store best-seller list since the day it was released. Just like the Kindle, you can purchase and download entire books from Amazon and display them on the iPod touch or iPhone’s screen. Given the much greater memory capacity of the iPod touch and iPhone, you could potentially have an even larger library in your pocket than the Kindle DX, and in color, no less -- except Kindle books are never in color. 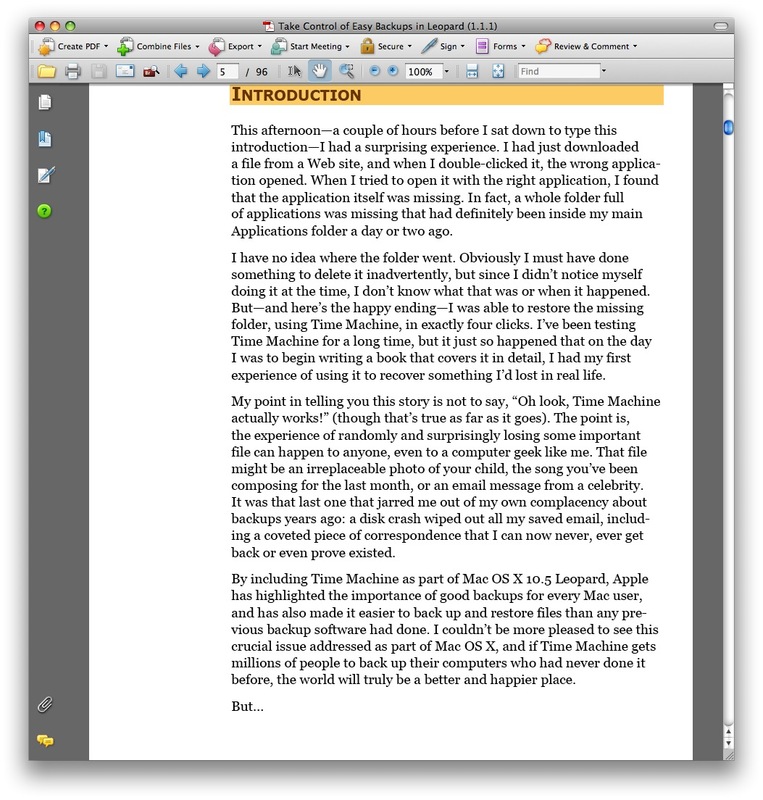 But the screen size is a problem: a page on the iPod touch is roughly a sixth of the size of a page on a Mac’s screen. 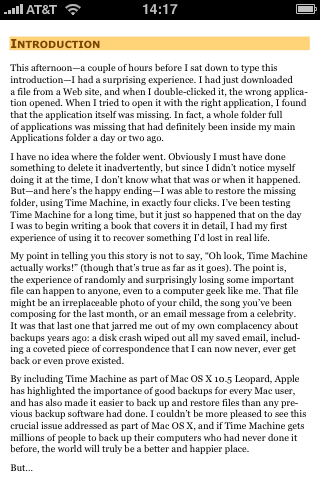 If you enlarge the text to make it easier to read on the iPod, the number of words on the screen drops to just a paragraph or less. Reading a book on an iPod touch or iPhone is possible, but it is slow and painful work. 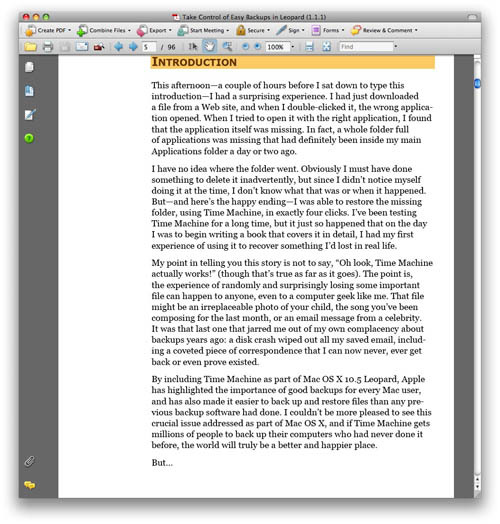 The same page from Take Control of Easy Backups in Leopard, published as an electronic book by TidBITS Publishing, showing the full-size view in Acrobat on a Mac screen with the superimposed image of the same page shown on an iPod touch. Click on the image for a fill-size view. The long-rumored (the rumor is a decade old) Mac tablet computer might change this equation. For now, Apple doesn’t have a device that can double as a handy portable electronic library. Take Control electronic books can be updated. When talking about the world going paperless, an oft-repeated observation is that the world will go paperless when restrooms go paperless. As it happens, restrooms are going electronic, if not exactly paperless. The owner of the building where I work recently installed electric toilets, urinals, and sinks. The toilets and urinals automatically flush, though “automatically” can sometimes best be translated as “unexpectedly.” Such innovations are not new, and allegedly save on wasted water. The electric sinks, on the other hand, are somewhat more problematic. Waving your hands around, trying to trigger the faucet, looks silly, and frequently doesn’t work. Waving your hands around, trying to trigger the soap dispenser is just as silly. Seeing your highly educated, highly professional colleagues try and “psych out” the sinks is hilarious. The other, more serious issue is the one of systems dependency. A 2,000 year old Roman toilet still works if the power goes out; this is not true of an electronic toilet. A power failure (or a computer failure) will not cripple a Roman bath, but it will kill an electronic sink and soap dispenser. And what value does an electronic paper towel dispenser have at all? Waving your hands around randomly to trigger the device does, perhaps, help air-dry your hands, but does a paper towel dispenser need an electric eye? What value is added? Great Britain, in this regard, is ahead of the U.S. Most restrooms are less, shall we say, inviting than their U.S. equivalents, but virtually every British restroom has an efficient electric hand dryer. Unlike the asthmatic hand dryers available in U.S. restrooms, British hand dryers have powerful motors that blow impressive amounts of hot air, drying your hands in seconds. Assuming, of course, there is electrical power. Longevity of information is a critical issue. Clay tablets can last at least 5,000 years, since such tablets exist by the thousands. Messages on tortoise shell can last at least 8,000 years, since many of these have been found, too. But in just the last 50 years, the computer industry has moved from punched cards to Mylar tape to 9-track magnetic tape to cassette tape to floppy disks to hard disks and, recently, flash memory. Each advance has brought greatly increased storage capacity, but also greater technological dependence. An old paper printout from 50 years ago is still readable; a floppy disk from five years ago is probably thoroughly scrambled. Are we ready to replace the paper book yet? The television and movie industry offer some sobering precedents. Early movies were filmed on celluloid; over time, the celluloid broke down, and became not just flammable, but explosive. Many early films literally went up in smoke, and no copies remain. Early television, broadcast live, had no method of preservation at all, unless someone filmed the broadcast. Later, the introduction of Sony Beta tape allowed storage of television on magnetic tape. But Beta lost in the consumer market, overtaken by VHS. And VHS tape is no longer made. Consumers wanting copies of movies or TV programs were encouraged to try VHS or Beta tape, LaserDisc, several varieties of DVD, then HD, and now Blu Ray. At each step, every investment in a prior technology was discarded. One friend of mine has a dozen copies of Gone With the Wind, but the technology to watch the copies has died away; only the most recent DVD version is viewable. 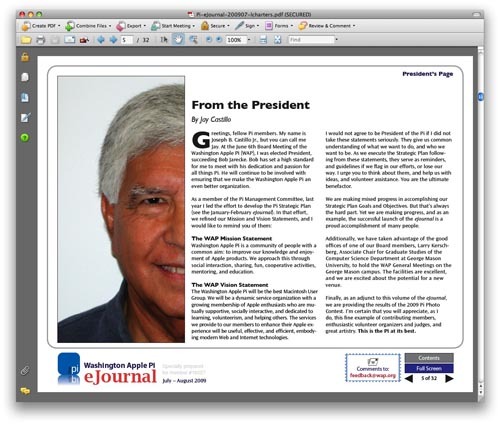 Is the electronic book ready for prime time? Will an electronic book published in 2009 be readable in 2059? Or even 2012? The paper and cloth copy of Tolstoy’s War and Peace that I purchased 40 years ago is still readable today. It requires no electricity, no complex infrastructure, and is highly portable. There is no reason to expect it to be less readable another 40 years from now. But I’d still kill for a Mac tablet computer.